This project status remains at urgent status (I.E. Yellow). For AD this effort remains on hold until the non-technical aspects of the project have been resolved. For META, progress has resumed. The team continues efforts to resolve duplicate user accounts. KUMC has completed renaming over 900 user-accounts. KUL has completed renaming 8,685 accounts. KUL will complete their remaining 1,646 user-account renames after the spring semester has started. This project is complete. We will continue to track progress on this initiative. The Increase MFD Usage team has completed standard operating procedures for optimizing MFD usage across campus, and is now implementing these processes in lockstep with the Reorganize and Redefine IT Staff and organization team. MFDs are being procured for computing labs leveraging LaserJets. Work is ongoing for the MFD Findings Document. There was a 1.7% increase in MFD usage for the month of December 2014 versus December 2013 with an overall 4% increase from FY14 to FY15. Efforts are focused on the following processes: Network Security Scans, Server Registration, New Server/Service Requests and Contract Renewals. 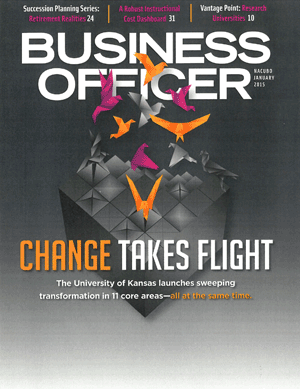 KU IT continues to work with the School of Architecture to discuss IT staff centralization. Network teams identified a dependency project to configure the wireless topology on the KU-L campus scheduled over Winter Break, which needs to be completed before we continue discussions on an integrated wireless network. The configurations to wireless were completed December 30. Recommendations on the future of Network Optimization have been submitted to KU Leadership for review. Based on the differences in the remaining initiatives, a recommendation to separate the scopes of wireless configurations and monitoring has been submitted, along with the next steps of action for both initiatives. Project teams will need to determine feasibility of solutions when direction is determined. We are moving forward with driving students to the updated portal as an entry point to CRM. All FY15 features within the project will follow a monthly release schedule provided to Leadership. Communications to campus will occur strategically as features are released and grouped.